Hello out there in crochet land! I apologize for not posting this pattern yesterday as I had planned. My littlest guy has been sick, so I've been in Nurse Mom mode. It is a very time consuming job! Here is the second donut pattern for you guys. These are made to resemble your cream filled type of donuts. My favorite part is doing the icing embroidery on the top! It's so fun! Am I easily amused or what? I'm thinking I may need to take a trip to Dunkin' Donuts soon and do a little research...for the sake of writing more patterns. I swear. I've made my donuts into pins, hair clips, and headbands, but there are a ton of other things you can use them for as well. These guys come out measuring just slightly over 2 inches. Just a note- I used scrap yarn for the icing colors, but my donut color was Red Heart Super Saver in Buff. As always, whatever you make from my patterns is yours to do with as you see fit. 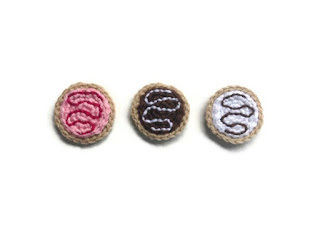 Sell pretty things, make gifts for friends, or go out and cover the world in crochet donuts! Just please don't sell or distribute my pattern as your own, and please don't use my pictures to represent your work. R4- In front loops only- Chain 1. 1 SC in same stitch as joining. 1 SC in next. 2 SC in next. *1 SC in next 2. 2 SC in next. * Repeat from *to* until end. Join. (24 SC in FLO). Finish off. R5- Switch to donut color. In back loops of R3- Chain 1. 1 DC in same stitch as joining. 1 DC in next. *1 DC in next 2. 2 DC in next. * Repeat from *to* until end. (24 DC in BLO). Join. Finish off leaving a long tail for sewing the icing to the donut portion. Use your third icing color to embroider a fun icing pattern, and enjoy your awesome crochet donut! If you want to see my pattern for the donut applique with holes just click here.